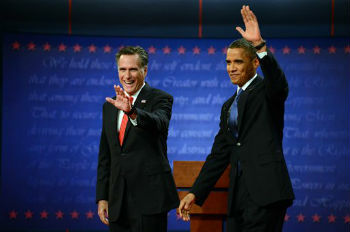 Little more than a month from Election Day, Republican Mitt Romney is barreling out of the first presidential debate energized by a solid performance that telegraphed his determination to take it to President Barack Obama with gusto. DENVER (AP) — Little more than a month from Election Day, Republican Mitt Romney is barreling out of the first presidential debate energized by a solid performance that telegraphed his determination to take it to President Barack Obama with gusto. The president, intent on keeping his momentum from stalling, is warning Americans that his GOP rival’s policy prescriptions for a fragile economy are more fantasy than reality.